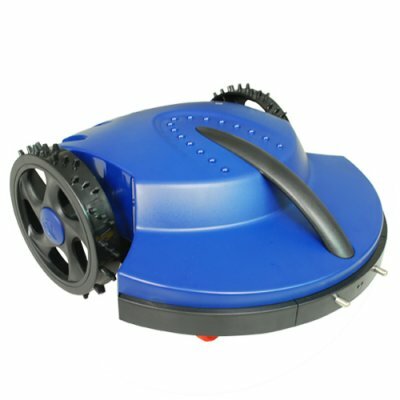 Successfully Added Robot Lawn Mower - Automatic Electric Robomower (110V) to your Shopping Cart. The robot lawn mower, also known as an electric robomower, is used for automatically cutting your grass lawn. This 110V version has a recharging station for use with 100-120 volt power supplies. Please note the power supply of this product is for use with a supply voltage of 100V-120V. Should you require a 220V model please order CVFN-OG01-220V. on 2009-05-20 21:59:02 It works so you don't have to! Let me say first that Chinavasion is wonderful; the best. That said, the robomower is awesome. The key to success with the mower is to read the book and then fill in between the lines. You have to lay out your virtual fence, about 14 inches from objects (easy to do) an tacked tight to the ground. Remember to allow at least 6 feet of straight wire before the charging station (centered and facing CCW). Claw'd, my "bot's" name, is a trip. I grab a book, sip some tea and watch him have fun!! !